Preheat oven to 350 degrees. 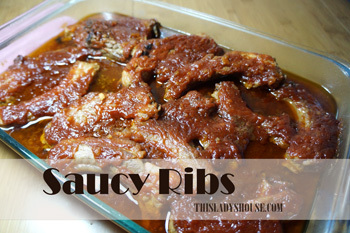 Brown ribs in a skillet and place in a baking dish. In a small bowl, mix remaining ingredients and pour over ribs. Bake, covered, for 2 hours. Uncover and bake 1 hour longer. This entry was posted in Recipe and tagged Dinner, Pork.